Addie is a very friendly and boisterous young GSD sadly in kennels waiting for her furever home through no fault of her own. Addie is 2 and half years old and spayed. Sadly although Addie has lived with a male GSD all her life, she has had no socialising with other dogs, so this will need working on. Addie has lived with children of all ages, but because of her tigger like bouncing about we will only rehome her to a home with children 7yrs plus as she is likely to knock any youngsters over very easily. 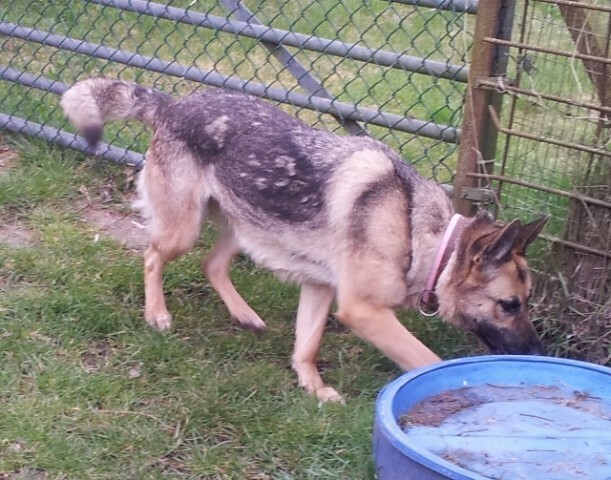 Although much loved Addie has no training, pulls on lead, very bouncy and really needs to be taught some manners . Having said that she is a an extremely friendly and loving girl who will thrive in the right home that will have the time and patience to teach her acceptable behaviour. Could you offer Addie that home?? ?